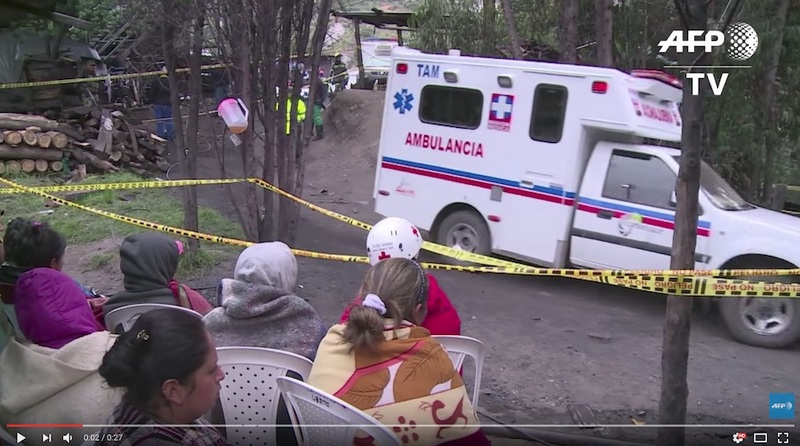 Rescue scene at an illegal coal mine explosion in central Colombia, Saturday. Video screenshot from AFP TV, via Youtube. Eleven miners were originally said to have died and two were missing following a methane gas explosion underground, according to a government statement reported by Reuters. The death toll was later revised to 13. The accident took place in Cundinamarca province, where illegal underground coal mining is reportedly widespread. In another report by Associated Press, National Mining Agency President Silvana Habib Daza said the mine was operating without permits and lacked proper safety equipment. It added that eight people died at a mine in the same town of Cucunuba in 2008.